Before we delve into the reasons for the crisis of the state it is necessary to clarify the meaning of ‘nation’. Nation has a cultural connotation and its distant origins are historically much older than state: it is still recognisable as a nation even when its borders have not been marked out and, at least formally, it is still not a state with its own laws. A population that is recognised as a nation feels free in the territory in which it lives and does not need to set limits on their freedom of movement within that space that they feel belongs to them. And yet a country can continue to exist only if it exists as a state, that reinforces its identity and ensures precise territorial limits, because while the idea of “nation” is a feeling, the state – more pragmatically – needs a territory in which to take root. According to Jürgen Habermas, on the other hand, “national community does not precede the political community, but it is the product of it” (The Postnational Constellation: Political Essays, Polity Press, 2000, p. 76). A statement which is partially accepted, if we admit that the idea of nationality can mature only within a state, which, however, does not take into account the presence of a core of national feeling (although not institutionalised) on which to build a state. State and nation go together and support each other, but something began to change in the late seventies and subsequent decades, in correspondence to the dissolution of modernity. The anthropologist Arjun Appadurai was the first to report that the concept of nation is entering a crisis (Modernity at Large: Cultural Dimensions of Globalization, University of Minnesota, 1996), because it is the very cultural identity that is first damaged by the change taking place. What is called into doubt is the idea of the national community, based on the same language, same customs, same religion, same culture. The opening of borders is preceded by a cultural openness that upsets the age-old certainties. The idea of nation endures while the presence of linguistic, religious or political minorities is “confined” temporarily or geographically in “enclaves” in ghettos, in refugee camps or in shelters. Then, when the diasporic communities begin to see recognition of their rights as citizens with full rights, and then demand recognition of their “diversity” with respect to the obligation to integrate (the customary path towards equality), the ‘unity of the nation begins to crumble. Already in the nineties, Appadurai talked about post-national states, where diasporic communities are no longer occasional or temporary events, but long-lasting ones built into the system, which have become an integral part of the culture and history of a country. The term post-national better defines the earlier concepts of multinational and international, that remain fairly strongly related to economic, legal and practical dependence with the state as reference, until the entire system is weakened. We live in a constant state of crisis, and this crisis also involves the modern state, whose structure, functionality, effectiveness (including the system of democratic representation) are no longer suited to the times in which we live. There are many critical issues facing the modern state and the causes are many: some induced by deep historical and cultural changes that took place between the end of the twentieth century and the beginning of the third millennium, others by political and economic choices that led to consequences in people’s daily lives, further exasperating the distance from the institutions. In the first place, the end of the post-Westphalian model. It appears crucial to an understanding of the present condition starting from the loss of meaning of this model of balance between states, which has stood for centuries and has been the cornerstone of international relations. The Treaties of Westphalia (Münster and Osnabrück) in 1648 (then essentially reconfirmed by the statute of the United Nations) have established some basic principles on which to base the rights and limits of the modern state, the new civil system that was born from the ashes of feudalism and that Hobbes represented as metaphoric in Leviathan: a form of monstrous strength made up of all the men who gathered together and recognised each other in a superior unity. Based on the principle of limited sovereignty, the post-Westphalian model recognises in the modern state absolute and indivisible sovereignty over its territory and ownership in international relations, of which it is the sole subject. If for a long time the state and nation have been able to live together, united on a historical and legal level by the insolubility of the fundamental principles that modernity assured, it was thanks to the agreements made in the Treaties of Westphalia, at the end of the long religious war, that had shattered Europe for thirty years. Since then, modern states, in the form that we have known for centuries, have standardised the so-called “post-Westphalian model”, which sets down the rules of universal stability and recognises the full sovereignty of a state within its own borders. In the third millennium, it is the very post-Westphalian model that enters into crisis, dragging with it the crisis of the modern state, which is determined not only by the opening of borders, but by the inability demonstrated in maintaining its commitments to its citizens. In this phase, it is the “internal” boundaries that create problems. Security, defence of privilege, identity, recognition and cultural traditions, which once coincided with the boundaries of the post-Westphalian state, are now altered, uncertain, liquid. They are no longer reliable. The dissolution of geographical or temporal limits imposed on diasporic communities determines the well-known phenomenon of the turnaround: if in the past it was the majorities that enclosed the minorities in “enclaves”, now it is the same majorities that shut themselves inside the “gated communities”, guarded by private security guards, by electronic control and security systems; jealous of the privacy that is no longer guaranteed on the outside. Now it is clear how this model entered into crisis with the development of globalisation, whose explosive force has erased the boundaries between states and undermined any claim of absolute sovereignty. But the consequences of globalisation are not limited only to undermining the rules of international relations; they have led to a further upheaval, removing the power and raising it to a higher level. Now it is distant and spread on a global level, thus separated from politics, with which, up to now, it had been intimately linked. Hobbes’s Leviathan, deprived of its operating arm, is reduced to a mutilated body that wallows in its impotence. It gets agitated, argues and proclaims, but can not do anything even when it has made momentous decisions because the operational side is the responsibility of others. This no longer belongs to it. The separation of politics and power is lethal to the modern state. Especially if it is a democratic state, whose constitution has promised its citizens to let them take part in common decisions that but now are taken by bodies that are non-democratically appointed or controlled from the bottom. The tragedy of the modern state lies in its inability to implement at a global level the decisions taken locally. The citizen, for example, elects their representatives to the European Parliament, who, in turn, elect committees and subcommittees, where executive decisions are taken by the last organisational bodies, formed on the basis of a series of institutional changes, the complexity of which should be a guarantee of impartiality and independence. If it were just a matter of bureaucracy, complicated by the presence of more than one body, the system would still retain some form of democracy, although there is no direct relationship (no feedback, no opportunity to reply) between the last of the voters of a small European country and the drafter of a Community regulation. The problem is more serious, from the moment when the most important decisions on an economic, financial and developmental level are taken not by institutional bodies, as required by a democratic system, though it be a rather loose network, but by groups of power, by holding companies, multinationals, lobbies and the so-called “market”, that is by a summation of personal actions, technical consequences, emotional reactions, political will and particular interests that overlap in a very confusing manner and determine the fate of millions of people without any liability. Everything seems to happen because this is how the world turns and no one is able to oppose it. Not the people taking to the streets, protesting, whose only result is, at best, to sensitise public opinion that is otherwise distracted by an excess of information. Not even the nation-state, which does not have the instruments needed to operate at global distances and never had, since the issue had never been raised before. Before being physical, political, legal and economic, in compliance with the post-Westphalian model, borders have always maintained that balance of strength and relationships which now no longer exists. The crisis of the state coincides with the crisis of the post-Westphalian model, whose certainties have been swept away by the opening of borders, by increasingly more rapid exchanges of communications, by an economy at a global or supranational level and, not least, by a culture which is no longer at a local level, and is deeply influenced by suggestions, information, and comments from all over the world. The global village of McLuhan was created (or is being created) thanks to economic and cultural exchange, but at the expense of system-states that it is no longer in line with the changing times. Admiral Horthy may be long gone, but just lately he appears to have become all the rage in modern Hungary. Newspapers sympathetic to the governing Fidesz party continually run glowing editorials about this ‘honourable’ man, along with statues and parks being awarded his name. Despite their legacy as ‘The Alliance of Young Democrats’, some in the ageing and increasingly authoritarian Fidesz party have found a historical hero who was certainly no democrat. As the 1930s progressed, the electoral franchise was progressively choked off in Hungary, quietly ensuring a succession of increasingly nationalistic and right-wing governments. Areas where the social democrats were strongest were effectively deprived of the vote through bureaucratic manipulation and banning of trades union activity. Meanwhile, in rural areas, landlord control of the franchise was overt. The ‘good old days’ to which many Fidesz supporters refer to, were also the days when Roma were physically segregated into remote slums, invisible but for the occasional presence of the gendarmerie, who would brutally and violently ensure that the locals knew their position at the very base of society. When a leading Fidesz organizer and friend of the Prime Minister declares in an opinion column that ‘most gypsies are animals’ it is against this historical context. Yet it’s also against the context of a Hungarian Right which has established no clear institutional ethical boundaries against racism, and which has increasingly relied upon nationalist rhetoric in the last 20 years. The ruling party in 1990′s first post-transition government, the MDF (Hungarian Democratic Forum) even included Istvan Csurka among its leaders. Csurka was an overtly anti-Semitic nationalist politician, dedicated to restoring Hungary’s pre-World War One borders. His presence at the centre of post-transition political life indicated the weakness of democratic forces, even at the height of their supposed triumph. Even as Csurka was expelled from the collapsing MDF administration, the government engineered a ceremonial reburial of Admiral Horthy’s bones in his home village of Kenderes. The Hungarian right’s love of ceremony and pageant – in somewhat embarrassing homage to the anachronisms of the United Kingdom – extended to a huge parade marking the relocation of the Crown to Parliament in 2000 – investing Parliament with ‘holy’ authority. Such mystical references are common currency across the Hungarian right-wing, whether supporters of ‘center-right’ Fidesz or ‘far-right’ Jobbik. It’s part of the deliberately mixed messages being sent by Fidesz. One week the Prime Minister can meet for photo-opportunity with rabbis, the next week, the Fidesz Deputy President can attend a commemoration for a Hungarian Nazi writer. There is always an eye for an opening. Horthy might be a strange hero to many people inside and outside Hungary, but it’s especially alarming to consider that the same political forces who indulge in Horthy-worship are also the people centralising control of the Hungarian state (especially schools), redrawing a constitution and creating a whole new set of apparently ad-hoc electoral laws, the ultimate effect of which would be to make it very, very hard to elect a new government. Having won a two-thirds majority, Fidesz are attempting to exploit an opportunity to remake the administration of Hungary, as well as cementing their dominance over the future electoral process. Anyone who remembers the 2002 Election, in which Fidesz attempted to defend its position in office against the Socialists, will remember the partial and disgraceful overt manipulation of public media. Government spokesmen and supporters dominated the programming. The editors of the public broadcasting channels even started broadcasting Fidesz rallies live-to-air – risking the ire of those who were looking to consume the normal diet of soaps and cheap cop dramas. The new electoral law attempted to consolidate this control of public media by preventing commercial radio and television channels from running party political programmes or advertisements during the campaign, leaving only the state-controlled media to provide political analysis. The intention was to drive the opposition off air. Already we can see the beginnings of the 2014 campaign, with posters plastered on buses and placards around the city, blaming the previous government for Hungary’s problems. It seems much of the funding for this is already coming from state sources. When added to a number of bogus consultations concerning the constitution and the ‘job protection’ campaigns, Fidesz are spending an absolute fortune on communications. The next logical step is to remove the official state budget for political parties, thereby ensuring such massive communications machines are funded from either secretive or ‘grey’ sources. If enacted, it ensures a system that retains the outward trappings of democracy, whilst engaging in multiple instances of manipulation at different levels. The open gerrymandering of electoral districts is, from a UK perspective, more normal, but will further reduce the prospects of change in Hungary, whilst the reallocation of seats has been entirely driven by use of the two-thirds supermajority, with no attempt to garner a consensus. Finally, and in tune with 1930s Hungary, the new electoral laws proposed a move away from a simple system of voter lists, to a system of voluntary registration. It is here that the government have been placed most under pressure, both internally and externally. Originally, the registration process was intended to involve people presenting themselves physically in a governmental office with the necessary forms of ID. Access to these offices could therefore be made as obscure, or as irregular as necessary, and would be a daunting test of organization and finance, as all parties would need to ferry many of their voters to the offices, or at least ensure as many were registered as possible. The Constitution Court has rejected the electoral laws, indicating dissent in the ranks – but it remains the undeniable case that the party leadership, Viktor Orban himself, wanted to push these changes through. We could argue that Fidesz, at root, is nothing more than an electoral/communications machine, and in this sense is not so different to many other European political parties nowadays. This machine has even provided an easy cultural identity for Joe Public to adopt, a system of patronage for supporters and friends, plus a flexible and easily adaptable set of policies, which vary from economic liberalism, to nationalism, to oligarchy, depending on the lay of the land. Yet the rancid nationalism and overt racism of many Fidesz supporters stops it being a question of abstract political science, and illustrates the dilemma that Fidesz has built for itself. For such a machine would obviously not want to risk being thrown out of office –a negative democratic verdict would be too costly to the many interests at stake in such a centralized system of patronage. Yet at the same time, Fidesz retains those same people who were part of the democratic opposition in the communist era, and whose political self-image is based partially upon being democrats in opposition to undemocratic communists. Fidesz need to distance itself from the far-right in some ways, whilst also retaining its nationalist rhetoric and feeding the monster it has helped to create. By understanding that Fidesz are increasingly being torn in both directions, we can surely begin to appreciate that while the Association of Young Democrats may have a somewhat elastic understanding of the word ‘democracy,’ internal rivalries and dubious decision-making increasingly question the viability of Orban’s all-encompassing governing project. Paradoxically, this coincides with the continued consolidation of absolute power. This should not obfuscate – the prospects for democratic change and political engagement with social realities in Hungary appear singularly bleak, regardless of right-wing factionalism. Nicht mehr das Volk, der eigentliche Souverän, sondern die Finanzmärkte bestimmen die Maximen der Politik. Das Ergebnis ist dann die „marktkonforme Demokratie“, die Angela Merkel als Leitbild ausgegeben hat. Mit einer lebendigen Demokratie hat dies jedoch nichts zu tun, es handelt sich vielmehr um eine demokratische Fassade hinter der ganz andere Kräfte die Fäden ziehen, wie das der britische Politologe Colin Crouch als Postdemokratie beschrieben hat. Wenn in Griechenland und Italien demokratisch gewählte Regierungen durch sogenannte Expertenräte ersetzt werden, ist das nach klassischer Definition keine Demokratie mehr, sondern eine Technokratie. Übersetzt aus dem Altgriechischen bedeutet dieser Begriff denn auch »Expertenherrschaft«. Diese Entwicklung ist bedrohlich. Geradezu erschreckend ist jedoch, wie widerstandslos diese Aushöhlung der Demokratie hingenommen wird. Wer es nicht besser wissen kann und sich duckt, mag ein Opfer sein. Wer es besser wissen könnte, aber lieber freiwillig mit dem Strom schwimmt, ist schon kein Opfer mehr. Und wer es besser weiß und dennoch den Mund hält, ist kein aufrechter Demokrat und feige ist er obendrein. Schon einmal ist in Deutschland die Demokratie gescheitert und in einer Katastrophe gelandet, weil es zu wenig aufrechte Demokraten gab oder zu wenig Kräfte, die sich mutig für die Demokratie aktiv einsetzten. Weder die Griechen noch wir sind unmündige Kinder oder senile Greise, denen man einen Vormund vor die Nase setzen kann. Alle Staatsgewalt geht vom Volke aus und nicht vom Finanzsystem. Deutsche Kanzler und Minister schwören in ihrem Amtseid, dass sie ihre Kraft dem Wohle des deutschen Volkes widmen, seinen Nutzen mehren und Schaden von ihm wenden werden – vom Nutzen für die deutschen Banken ist in diesem Eid nicht die Rede. Seit wann nimmt die Öffentlichkeit es eigentlich ohne weitere Klagen hin, dass die deutsche Politik die Verfassung eines souveränen, demokratischen Staates außer Kraft setzten will, indem sie dem Parlament das Budgetrecht abspricht? Während das Bundesverfassungsgericht den deutschen Politikern hier sehr restriktive Leitplanken gesetzt hat, lässt man andererseits jeglichen Respekt vor der Verfassung anderer demokratischer Staaten vermissen. Griechenland – so hat es den Anschein – gilt für die Eliten dieses Landes als eine Art seniler Großvater, den man davon schützen muss, auf Nepper, Schlepper und Bauernfänger hereinzufallen, indem man ihm die Geschäftsfähigkeit aberkennen lässt und selbst die Vormundschaft anmaßt. Man erklärt die griechische Demokratie inzwischen reflexhaft für unfähig, die eigenen Interessen erkennen oder gar vertreten zu können, erklärte sie schlicht für unmündig und ignoriert damit sogar das demokratische „Königsrecht“ eines Parlaments, nämlich die Haushaltshoheit in einem Maße wie es in der Geschichte bisher nur durch Gewalt- oder Kriegsandrohung oder durch militärische Besetzung möglich war. Unter dem Deckmantel der Stabilisierung des Euros und der Erhaltung der Europäischen Währungsunion will Deutschland Ländern wie Griechenland in ein Verhältnis zwingen, das wohl am ehesten einem Status entspricht, den Völkerrechtler als „Suzeränität“ bezeichnen – nämlich das Übertragen verschiedener elementarer Bereiche staatlicher Souveränität an einen mächtigeren Staat („Suzerän“). So war es etwa zu Zeiten des britischen Empires vollkommen normal, dass britische Beamte im Auftrag der mächtigen Britischen Ostindien-Kompanie die Fiskalpolitik der indischen Fürstentümer im britischen Machtbereich „koordinierten“. Nicht großartig unterschiedlich ist da der Vorschlag des CDU-Politikers Volker Kauder zu werten, der deutsche Beamte dazu einsetzen will, die fiskalischen Vorgaben, die Griechenland von der deutschen Regierung über die EU diktiert bekommen hat, gegen demokratisch legitimierte Entscheidungen knallhart vor Ort durchzusetzen. Hinter den Kulissen zieht diesmal nicht die Ostindien-Kompanie, die eine Vereinigung reicher Londoner Kaufleute war, die Fäden, sondern ein weitestgehend anonymes Konglomerat der Hochfinanz, das gerne beschönigend mit dem Begriff „Finanzmärkte“ umschrieben wird. Eigentlich müsste ein Politiker wie Volker Kauder, der schon mit seiner chauvinistischen Aussage „in Europa wird wieder deutsch gesprochen“ unsere Nachbarn gegen Deutschland aufbrachte, und der nun mit seinem Ruf nach einer Art „Generalgouvernement Griechenland“ nicht nur alles in den Schatten stellt, was man in puncto Taktlosigkeit von Unionspolitikern kennt, sondern auch offen einem befreundeten demokratischen Staat die Souveränität abspricht, doch mit Schimpf und Schande aus dem Reichstagsgebäude gejagt werden. Ein derartiges Ultimatum, worin sie Griechenland zur Aufgabe seiner Budget-Hoheit auffordert, das die deutsche Kanzlerin in Brüssel einreicht, erinnert an die dunkelsten Stunden der deutschen Geschichte. Diese Art von Großmannssucht trägt dazu bei, dass man sich wieder schämen muss, ein Deutscher zu sein, wenn man ins benachbarte Ausland reist. Doch wer hat eigentlich bei uns diese zutiefst antidemokratischen Äußerungen kritisiert? Wer hat die Wahrung demokratischer Grundsätze in Europa öffentlich verteidigt? Die deutschen Politiker der aktuellen und früheren Regierungsparteien, die gerne in Sonntagsreden bei feierlichen Anlässen ihr Hohelied auf unsere freiheitliche demokratische Grundordnung singen, jedenfalls nicht. Nein, Demokratie scheint für diese Politiker nur so lange ein schützenswertes Gut zu sein, so lange sie ihnen erlaubt, ihre eigene von Ideologie bestimmte Politik demokratisch zu legitimieren. Sind jedoch die Interessen der Mehrheit nicht deckungsgleich mit der von solchen Politikern vertretenen Dogmen, geraten die Sonntagsreden schnell in Vergessenheit. Haben die deutschen Leitmedien auch nur in einem einzigen kurzen Moment die von der Bundesregierung geforderte Suspendierung der griechischen Demokratie beklagt? Nein, die honorigen Leitartikler, die sich stets in anmaßender Hybris in der Rolle der vierten Gewalt gefallen, haben nicht nur in diesem Fall als Verteidiger demokratischer Grundprinzipien auf ganzer Linie versagt. Wie kann man ihnen da noch die Verteidigung der deutschen Demokratie zutrauen, wenn sie noch nicht einmal imstande sind, mahnend die Stimme zu erheben, wenn vor ihren Augen die Demokratie eines Staates der Europäischen Union außer Kraft gesetzt werden soll? Dabei ist Griechenland nur die sichtbare Spitze eines riesigen demokratiegefährdenden Eisbergs, der auch schon den Rumpf des deutschen Politdampfers auf bedrohliche Länge aufgerissen hat. Auf ganz vielen Feldern – angefangen von den Hartz-Reformen, über die Rente mit 67, dem Mindestlohn bis hin zum Militäreinsatz in Afghanistan – hat sich die Politik von den Bürgern und deren Sorgen und Interessen verabschiedet. Sie dient nicht dem Allgemeinwohl, sondern den Partikularinteressen einer sehr einflussreichen finanzkräftigen und dementsprechend meinungsmächtigen Minderheit. Quer durch wichtige Bereiche des gesellschaftlichen Zusammenlebens bestimmen diese Partikularinteressen die politische Agenda. Dies gilt ganz besonders für die ökonomischen Interessen des Finanzsektors. Die Finanzwirtschaft hat die Politik der letzten Jahre zunächst mit ihrem Druck auf die Deregulierung der Finanzmärkte vor sich her getrieben hat und nunmehr – durch die dadurch ausgelöste Krise – geradezu zu ihrem Bittsteller gemacht hat. Die gesamte europäische Politik buhlt nur noch um das „Vertrauen der Märkte“. Und die Medien plappern das von morgens bis abends auf allen Kanälen nach. Durch die Finanzkrise und die durch sie ausgelöste Eurokrise findet Politik nur noch als Reaktion auf die Märkte statt. Nicht mehr das Volk, der eigentliche Souverän, sondern die Finanzmärkte bestimmen die Maximen der Politik. Das Ergebnis ist dann die „marktkonforme Demokratie“, die Angela Merkel als Leitbild ausgegeben hat. Mit einer lebendigen Demokratie hat dies jedoch nichts zu tun, es handelt sich vielmehr um eine demokratische Fassade hinter der ganz andere Kräfte die Fäden ziehen, wie das der britische Politologe Colin Crouch als Postdemokratie beschrieben hat. Weder die Griechen noch wir sind unmündige Kinder oder senile Greise, denen man einen Vormund vor die Nase setzen kann. Alle Staatsgewalt geht vom Volke aus und nicht vom Finanzsystem. Deutsche Kanzler und Minister schwören in ihrem Amtseid, dass sie ihre Kraft dem Wohle des deutschen Volkes widmen, seinen Nutzen mehren und Schaden von ihm wenden werden – vom Nutzen für die deutschen Banken ist in diesem Eid nicht die Rede. Es ist an der Zeit, dass wir die Politik einmal daran erinnern, wer der Souverän ist. Mehr und mehr kommt man sich hierzulande vor wie eine Laborratte, der zur Durchführung eines ideologischen Laborversuchs gezielt Schmerzimpulse zugefügt werden, um herauszufinden, wo die Schmerztoleranzschwelle liegt, von der an sich die Ratten sich zur Wehr setzt. Unsere Schmerztoleranz scheint sehr hoch zu sein, wir befinden uns geradezu in einer dauerhaften Duldungsstarre. Nur wenn wir daraus aufwachen, werden wir wieder umgekehrt, der derzeitigen Politik ihre Grenzen aufzeigen können. Je länger wir uns alles gefallen lassen, desto hinfälliger wird unsere Demokratie. Ihre Totengräber sind die Eliten, aber wir schauen ihnen tatenlos zu. Muss denn immer erst eine Katastrophe eingetreten sein, bis die Deutschen von einem ideologischen Regime befreit werden können? Verfassungsschutz: Das ist ein irreführender, ein falscher Name. Falschnamen gehören in die Welt der Geheimdienste. Und Verfassungsschutz ist der Falschname für den deutschen Inlands-Geheimdienst. Man tut damit so, als sei er so etwas Ähnliches wie das Verfassungsgericht. Das ist eine Anmaßung. Alljährlich präsentiert der Bundesinnenminister einen "Verfassungsschutzbericht", und er tritt dabei auf, als verkünde er ein höchstrichterliches Urteil. Es handelt sich aber nur um die von ihm redigierten Tätigkeitsberichte des Inlandsgeheimdienstes, die man - wie man seit der neonazistischen Mordserie weiß - insoweit auch Untätigkeitsberichte nennen kann. Der Verfassungsschutz ist kein Verfassungsorgan, sondern ein Behördenkonglomerat, das im Geheimen operiert, von der Regierungspolitik dirigiert wird und von der Justiz nicht kontrolliert werden darf - dessen Überwachungskompetenzen in den vergangenen zehn Jahren aber erheblich ausgeweitet worden sind. Das passt nicht zu der Offenheit, die eine Demokratie auszeichnen soll, und nicht zu der Rechtsstaatlichkeit, deren sich die Bundesrepublik rühmt. Dafür passt das Agieren des Verfassungsschutzes zu den Vorurteilen, gegen die er sich vergeblich wehrt, weil er sie selber bestätigt: dass er auf dem linken Auge scharf-, aber auf dem rechten fehlsichtig sei. Jüngst ist öffentlich geworden, dass der Verfassungsschutz Abgeordnete der Linken im Bundestag überwacht. Wenige Wochen vorher waren die zehn Morde der Neonazis bekannt geworden, von denen der Verfassungsschutz nichts mitbekommen hat oder nichts mitbekommen haben will. Ein Untersuchungsausschuss des Bundestages, soeben zusammengetreten, soll klären, wie das geschehen konnte. Es hätte von Beginn der Bundesrepublik an gute Gründe gegeben, die Union und die FDP zu beobachten, weil sie reihenweise Nazis aufgenommen haben. Es hätte gute Gründe gegeben, gegen Politiker der Union wie Streibl und Strauss vorzugehen, weil sie Volksverhetzung betrieben haben. Nichts da. Aber Abgeordnete der Linken und Teile der Partei werden beobachtet, obwohl sie gewählt worden sind und keine verfassungsfeindliche Programmatik oder Aktion erkennbar ist. Die Beobachtung dient eindeutig der Diskreditierung, sonst nichts. Es ist der Versuch, die politische Konkurrenz zu schwächen. Deshalb auch der laue Protest der SPD, die von der Diskreditierung der Linkspartei zu profitieren hofft. Alle sind sie daran interessiert, nicht die Gefahr einer politischen Alternative zu Angela Merkel aufkommen zu lassen. Die SPD merkt das nur nicht, worauf wir hier aufmerksam machten. Aber gerade eine antizyklische Finanzpolitik, also eine aktive Konjunkturpolitik durch den Staat, wird durch den Fiskalpakt, wenn nicht ausgeschlossen, so doch wesentlich eingeschränkt. Man kann es also auch so sagen: Mit dem Fiskalpakt wird eine ganz bestimmte Finanz- und Wirtschaftspolitik auf einen Verfassungsrang erhoben. Nämlich das neoliberale Dogma, das den Staat zugunsten der Marktkräfte zurückdrängen will und dem Staat eine schädliche Wirkung auf den marktwirtschaftlichen Wirtschaftsablauf zuschreibt. Merkel nennt das „marktkonforme Demokratie“. Keynesianische oder Neokeynesianische Wirtschaftslehren, die von einer prinzipiellen Instabilität der „Märkte“ ausgehen und deshalb eine aktive Rolle des Staates mittels der Finanz- und Wirtschaftspolitik für das Wirtschaftsgeschehen verlangen, werden also durch Schuldenbremsen, wenn nicht nur wesentlich eingeschränkt sondern sogar per Verfassung verboten. Wer betreibt eigentlich einen Systemwechsel? Zwei Nachrichten beschäftigten in der zurückliegenden Woche die Politik und die Schlagzeilen der Medien: Erstens das Weltwirtschaftsforum in Davos und dabei vor allem die Eröffnungsrede der Kanzlerin und zweitens die Beobachtung und Überwachung von Parlamentariern der Partei DIE LINKE durch den Verfassungsschutz. Für die Beobachtung und Überwachung von Politikern der Linkspartei wird als Begründung herangezogen, dass die Gefahr bestünde, dass diese Partei oder einige ihrer Gruppierungen einen „Systemwechsel“ herbeiführen wollten: “Wer den Systemwechsel in Deutschland fordert, über Wege zum Kommunismus schwadroniert und sich mit Diktatoren solidarisiert, darf sich nicht wundern, wenn er vom Verfassungsschutz beobachtet wird”, sagte CDU-Generalsekretär Hermann Gröhe. Um einen Systemwechsel geht es bei genauer Betrachtung aber auch bei der vor allem von Kanzlerin Merkel für die Länder der Währungsunion angestrebten „Fiskalunion“: Also mit der möglichst in den Verfassungen zu verankernden „Schuldenbremse“, deren Überwachung durch die Behörde der Europäischen Kommission und – bei einem Verstoß gegen die Verschuldungskriterien – der Klagemöglichkeit vor dem Europäischen Gerichtshof. Darüber hinaus soll der Fiskalpakt unter Umgehung der Europäischen Verträge separat in einem zwischenstaatlichen Vertrag festgeschrieben werden. Warum muss man bei diesem Fiskalpakt von einem Systemwechsel sprechen? Selbst wenn man dieser eindimensionalen Betrachtung der Krisenursache folgte, dann wäre es Aufgabe der Politik durch entsprechendes finanzpolitisches Handeln diese Krise zu bekämpfen. Doch die deutsche Kanzlerin vertraut der Politik (genauer gesagt demokratischen Entscheidungen über die Haushaltspolitik) nicht mehr, sie verlangt „Verbindlichkeit“ und will deshalb überall Verfassungsänderungen herbeiführen, die die Politik einklagbar zwingen sollen, die Staatsausgaben zu reduzieren. Sparpolitik wird so zum Verfassungsgebot. Nun könnte man vielleicht sogar noch sagen die Kürzung von Staatsausgaben könnte einer der Wege zum Schuldenabbau sein. Aber es ist eben beileibe nicht der einzige. Im Gegenteil: Es gibt eine empirische Evidenz, dass eine aktive Konjunktur- und Beschäftigungspolitik durch den Staat sich in der Vergangenheit als ein weitaus erfolgreicheres Mittel zur Abtragung von Staatsschulden erwiesen hat. Indem nämlich durch ein höheres Wirtschaftswachstum die Steuereinnahmen gesprudelt sind und dadurch die Defizite nicht nur ausgeglichen sondern sogar wieder abgebaut werden konnten. Man sollte die Staatsschulden auch nicht immer nur absolut betrachten. Viel wichtiger ist, wie sich die Staatschulden in Relation zur Wirtschaftsleistung entwickeln. Entwickelt sich die gesamte Wirtschaft – also auch die Binnenwirtschaft – positiv, steigt das Bruttoinlandsprodukt und die relative Staatsverschuldung nimmt sogar dann ab, wenn gar keine Schulden abgebaut wurden. Sie würde sogar dann abnehmen, wenn die Neuverschuldung niedriger als das Wirtschaftswachstum ist. Erzeugt man jedoch durch die Budgetkürzungen eine Rezession, nimmt die relative Verschuldung auch dann zu, wenn gar keine neuen Staatsschulden aufgenommen wurden. Misst man die Bestrebungen nach einem Systemwechsel also an unserem Grundgesetz, dann bedeutet also die Einführung einer Schuldenbremse und deren Überwachung durch die EU-Kommission nebst einer Klagemöglichkeit vor dem Europäischen Gerichtshof eine viel weitergehende Systemveränderung als die Ziele, die das Programm der Partei DIE LINKE vorgibt und die sich ohne weiteres mit der geschriebenen Verfassung vereinbaren ließen. Aber schon Aristoteles hat sinngemäß gesagt: Das herrschende Recht ist immer zugleich das Recht der Herrschenden. Deswegen müssen gerade diejenigen, die die Macht haben, das geltende Recht zu verändern, die anderen besonders heftig bekämpfen, die solche Veränderungen politisch in Frage stellen – wenn es sein muss paradoxerweise sogar durch den „Verfassungs“-schutz. The 2012 National Defense Authorization Act, if signed into law, will signal the death knell of our constitutional republic and the formal inception of a legalized police state in the United States. Passed by the House on May 26, 2011 (HR 1540), the Senate version (S. 1867) was passed on Dec. 1, 2011. Now only one man — Barack Obama, a scholar of constitutional law — will make the decision as to whether the Bill of Rights he went to Harvard to study will be superceded by a law that abrogates it. What is at stake is more than the Constitution itself, as central as that document has been to the American experiment in democracy. What is a stake is nothing short of the basic fundamentals of western jurisprudence. Central to civilized law is the notion that a person cannot be held without a charge and cannot be detained indefinitely without a trial. These principles date back to Greco-Roman times, were developed by English common law beginning in 1215 with the Magna Carta, and were universalized by the Enlightenment in the century before the American Constitution and Bill of Rights were fought for and adopted as the supreme law of the land. For more than two centuries of constitutional development since then, the United States has been heralded as the light to the world precisely because of the liberties it enshrined in its Declaration of Independence and Constitution as inalienable. It now seems as if the events of 9/11 have been determined to be of such a threatening magnitude that our national leaders feel justified to abrogate in their entirety the very inalienable principles upon which our Republic was founded. At the heart of this Act is the most fundamental question we must ask ourselves as a free people: is 9/11 worth the Republic? The question screaming at us through this bill is whether the war on terror is a better model around which to shape our destiny than our constitutional liberties. It compels the question of whether we remain an ongoing experiment in democracy, pioneering new frontiers in the name of liberty and justice for all, or have we become a national security state, having financially corrupted and militarized our democracy to such an extent that we define ourselves, as Sparta did, only through the exigencies of war? Within a week of 9/11, the Use of Military Force Act was approved which authorized the full application of U.S. military power against “terrorism.” A month later, on Oct. 26, 2001, Congress overwhelmingly passed the Patriot Act that began the legislative assault on the Bill of Rights. The First Amendment right to freedom of association was gutted as federal officials were authorized to prosecute citizens for alleged association with “undesirable groups.” The Fourth Amendment right against unreasonable search and seizure was compromised by permitting indefinite detentions of those suspected of “terrorism.” The Fourteenth Amendment right to privacy was obliterated as unchecked surveillance was authorized to access personal records, financial dealings, and medical records of any citizen at any time without any judicial oversight or permission. Evidence obtained extra-judicially could be withheld from defense attorneys. The Patriot Act also criminalized “domestic terrorism.” It stated that civil conduct can be considered “domestic terrorism” if such actions aim to “influence by intimidation or coercion” or “intimidate or coerce a civilian population.” Put in plain language, this means that actions such as Occupy Wall Street can be designated as “domestic terrorism” by Federal authorities without judicial oversight and dealt with outside the due process of constitutional protections. Two weeks after passage of the Patriot Act, on Nov. 13, President Bush issued Military Order No. 1 authorizing the executive branch and the military to capture, kidnap, or otherwise arrest non-citizens anywhere in the world if suspected of engaging in terrorist activities. Proof was not required. It stipulated that trials, if held, would be military tribunals, not civil courts, and that evidence obtained by torture was permissible. No right of appeal was afforded to those convicted. Numerous executive orders, findings, and National and Homeland Security Presidential Directives followed, further consolidating the militarization of due process under the law and enabling the executive branch to act without legal constraint after it has defined a person or group as potentially engaging in “terrorist” activity. The next major step took place on Oct. 17, 2006, when Congress passed the Military Commissions Act that effectively abrogated habeas corpus for domestic and foreign enemies alike, stating, “Any person is punishable who aides, abets, counsels, commands, or procures” material support for alleged terrorist groups. One of the most basic principles of both our democracy and our civilization, that a person cannot be held without being charged, was surrendered, and done so by substantial majorities in both houses. 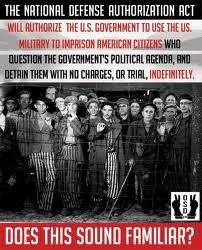 On the same day, the 2007 NDAA was passed, which amended the 1807 Insurrection Act and 1878 Posse Comitatus Act, prohibiting U.S. military personnel from acting upon U.S. citizens within U.S. borders. Not only was anything allowable in the pursuit of “terrorists,” but the military was authorized to conduct operations inside the homeland in their pursuit. Now comes the 2012 NDAA, which completes the process and thus serves as the coup de grace for a democratically voted metamorphosis from republic to national security state. It puts the final nail in the coffin of the Constitution by designating the entire United States as essentially the same “battlefield” in the war on terror as Iraq or Afghanistan, and authorizes the executive branch and the military to take whatever actions they consider legitimate against any human being anywhere on planet earth, civilian or enemy combatant, and to do so without any judicial oversight or constitutional constraint. If this Act is passed, the Bill of Rights will no longer protect American citizens from their government. The Constitution will no longer be the ultimate law of the land. The House and Senate versions of the Act must now be reconciled and the Act sent to the president to either sign or veto. With his decision, he will determine the fate of those very liberties which, up to this point, have been integral to and indeed have defined America. The Cold War ideological battle with universal aspirations has given way to a clash of cultures as the world concurrently moves toward globalization of economies and communications and balkanization through a clash of ethnic and cultural identities. Traditional liberal theory has confronted daunting challenges in coping with these changes and with recent developments such as the spread of postmodern thought, religious fundamentalism, and global terrorism. This book argues that a political and legal philosophy based on pluralism is best suited to confront the problems of the twenty-first century. Pointing out that monist theories such as liberalism have become inadequate and that relativism is dangerous, the book makes the case for pluralism from the standpoint of both theory and its applications. The book engages with thinkers, such as Spinoza, Kant, Hegel, Rawls, Berlin, Dworkin, Habermas, and Derrida, and with several subjects that are at the center of current controversies, including equality, group rights, tolerance, secularism confronting religious revival, and political rights in the face of terrorism. Part II. E Pluribus Unum? Part III. Can Pluralism Thrive in Times of Stress? 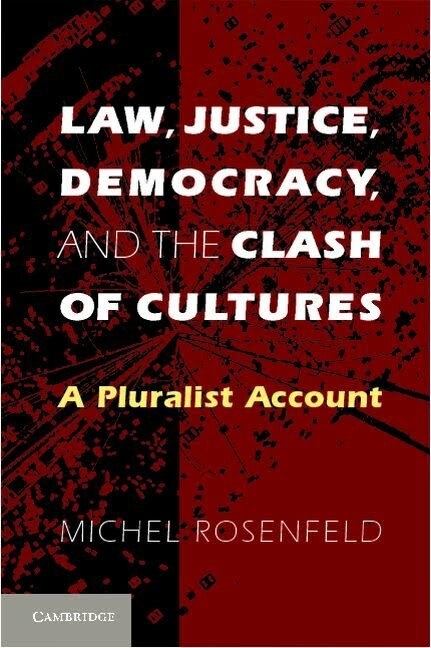 Michel Rosenfeld is Professor of Law, Benjamin N. Cardozo School of Law, Yeshiva University. He is Co-Editor (with Andrew Arato) of "Habermas on Law and Democracy: Critical Exchanges" (University of California Press, 1998). See also a panel discussion between Michel Rosenfeld, Jeremy Waldron, Tracy Higgins and Ruti Teitel on "What is Human Rights? Universals and the Challenge of Cultural Relativism" (pdf, 1999). Wie mehrere Zeitungen und Online-Portale berichteten, ereignete sich der Vorfall nach einem Treffen der NRW-Landesgruppe der Unionsfraktion im Vorfeld der Abstimmung über den Euro-Rettungsschirm EFSF. Bosbach lehnte die Ausweitung des EFSF entgegen der Linie von Regierung und Fraktionsführung ab, ebenso wie auch einige andere Abgeordnete von Union und FDP. Pofalla soll nach Angaben von Sitzungsteilnehmern Bosbach weiter mit den Worten beschimpft haben: "Du machst mit Deiner Scheiße alle Leute verrückt." Innen-Experte Bosbach verteidigte seine harte Haltung im Streit um den Euro-Rettungsschirm mit Verweis auf Gewissensentscheidungen von Abgeordneten: "Ronald, guck bitte mal ins Grundgesetz, das ist für mich eine Gewissensfrage." Pofalla antwortete: "Lass mich mit so einer Scheiße in Ruhe." Alle Menschen sind frei geboren und gleich in ihrer Würde und ihren Rechten, welche im Internet geachtet, beschützt und erfüllt werden müssen. Das Internet ist ein Raum zur Beförderung, zum Schutz und zur Erfüllung von Menschenrechten sowie zur Förderung von sozialer Gerechtigkeit. Jeder hat die Pflicht die Menschenrechte der anderen im Internet zu respektieren. Jeder hat das gleiche Recht auf Zugang und Benutzung zu einem sicheren und offenen Internet. Jeder hat das Recht Informationen im Internet frei zu suchen, zu finden und zu versenden, ohne Zensur oder andere Einmischung. Jeder hat das Recht, sich über das Internet frei für soziale, politische, kulturelle oder andere Zwecke zu versammeln. Jeder hat das Recht auf online Privatsphäre. Das schließt Freiheit von Überwachung, Recht auf Verschlüsselung und Recht auf Anonymität ein. Jeder hat das Recht auf Datenschutz, einschließlich der Kontrolle über Sammlung, Speicherung, Verarbeitung, Löschung und Veröffentlichung perösnlicher Daten. Das Recht auf Leben, Freiheit und Sicherheit muss online respektiert, geschützt und verwirklicht werden. Diese Rechte dürfen nicht eingeschränkt werden oder benutzt werden um andere Rechte im Internet einzuschränken. Kulturelle und Sprachliche Vielfalt im Internet müssen gefördert werden, Innovation der Technik und der [technischen] Richtlinien sollten gefördert werden um eine Vielfältigkeit der Ausdrucksformen zu erleichtern. Jeder soll universellen und offenen Zugang zu den Inhalten des Internets erhalten, frei von diskriminierender Priorisierung, Filterung oder anderer Datenverkehrseingriffe aus wirtschaftlichen, politischen oder anderen Motiven. Die Architektur des Internets, der Kommunikationssysteme sowie von Dokumenten and Dateiformaten soll auf offenen Standards basieren, welche vollständige Interoperabilität, die Inklusion und gleiche Chance für alle gewährleisten. Menschenrechte und soziale Gerechtigkeit müssen die rechtliche und normative Grundlage sein, auf welcher das Internet betrieben und verwaltet wird. Das soll auf transparente Weise und in multilateraler Ausrichtung geschehen, basierend auf den Prinzipien der Offenheit, Partizipation und Verantwortung. On the fly Übersetzung von mir. Sorry für Rechtschreibfehler und ein paar unschöne stellen. Die Internet Rights & Principles Coalition (IRPC) hat zehn Rechte und Prinzipien definiert und schlägt diese als Basis einer Diskussion über Internet Governance vor. Das kann ich so auch unterschreiben. Bisher gibt es zahlreiche Übersetzungen, aber keine ins deutsche. Update: Danke an Mayleen für die Übersetzung in den Kommentaren. All humans are born free and equal in dignity and rights, which must be respected, protected and fulfilled in the online environment. The Internet is a space for the promotion, protection and fulfilment of human rights and the advancement of social justice. Everyone has the duty to respect the human rights of all others in the online environment. Everyone has an equal right to access and use a secure and open Internet. Everyone has the right to seek, receive, and impart information freely on the Internet without censorship or other interference. Everyone also has the right to associate freely through and on the Internet, for social, political, cultural or other purposes. Everyone has the right to privacy online. This includes freedom from surveillance, the right to use encryption, and the right to online anonymity. Everyone also has the right to data protection, including control over personal data collection, retention, processing, disposal and disclosure. The rights to life, liberty, and security must be respected, protected and fulfilled online. These rights must not be infringed upon, or used to infringe other rights, in the online environment. Cultural and linguistic diversity on the Internet must be promoted, and technical and policy innovation should be encouraged to facilitate plurality of expression. Everyone shall have universal and open access to the Internet’s content, free from discriminatory prioritisation, filtering or traffic control on commercial, political or other grounds. The Internet’s architecture, communication systems, and document and data formats shall be based on open standards that ensure complete interoperability, inclusion and equal opportunity for all. Chronology of the 2009 Honduran constitutional crisis provides a detailed description of the political developments and events which led to, include, and follow the 2009 Honduran coup d'état and the constitutional crisis associated with it. The coup was widely repudiated around the globe, but Roberto Micheletti, head of the government installed after the coup, has claimed that the Honduran Supreme Court ordered the detention of Zelaya and that the following succession was constitutionally valid. The initial portion of the crisis involves a longer-running political battle between President Manuel Zelaya, with his leftward policy drift which culminated in a push to authorise a Constitutional Assembly to write or reform the Honduran constitution with a fourth ballot box referendum, and the remainder of the Honduran political establishment, which largely opposed the policies and considered the assembly illegal. The later portion of the crisis following the ouster of Zelaya deals with the interim presidency of Roberto Micheletti and the efforts to resolve the political crisis both domestically and internationally.